Cambodia CityLife 3rd issue is finally here! the 3rd Cambodia CityLife guide and magazine from VeroMediaDesign that was launched on 07/07/2010 and now its here as an E-magazine. CityLife is Cambodia’s premier FREE guide magazine, bringing good reading to all those in Phnom Penh and around town who like to keep their finger on their city’s pulse. Every two months, a glossy new volume of CityLife delivers fresh information. CityLife issue #3 will release soon! 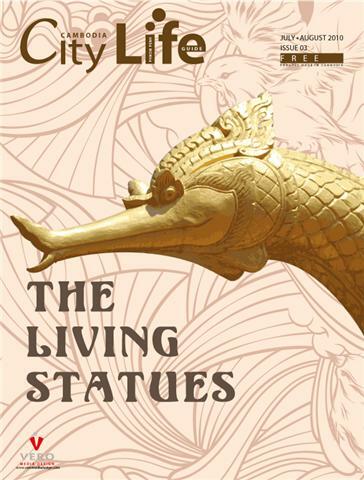 i just get my hand on CityLife issue#3 cover page this afternoon, its pretty exciting to see the phoenix head statues on the cover page. good impression with ” The living statues” i can’t wait to read it. we still don’t know what in this issue but should be something related to Khmer’s legend and history. i heard VeroMediaDesign plan to release this issue on the 5th of July but i’m not so sure if i can get the digital copy the same day as release date, but i’ll try my best to get it posted as soon as possible.